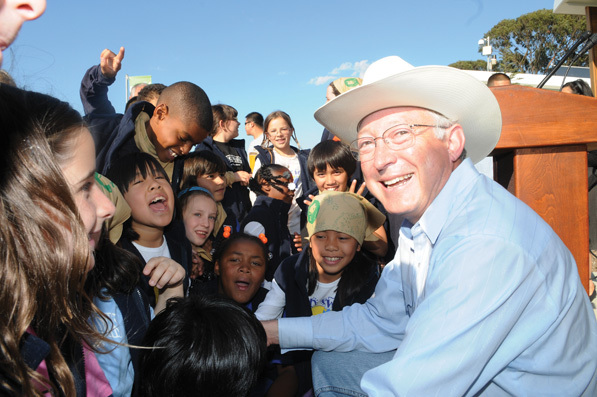 Secretary Salazar with children of Youth in Natural Resources, a program he created to educate young people about Colorado’s natural resources. Ken Salazar, an equity partner at the global law firm of WilmerHale, has an impressive résumé to say the least. Salazar is a former US secretary of the interior, United States senator, and attorney general of Colorado. Former Secretary Salazar has made such a positive impact for so many because he has never forgotten his roots, nor has he ever stopped encouraging young people to create their own path. Salazar, currently a partner at global law firm Wilmer Hale, sits on various corporate and community boards. Hispanic Executive caught up with him to chat specifically about the work he is doing as corporate director of Hispanic Association on Corporate Responsibility (HACR). What have you been up to since you ended your assignment as secretary of the interior? I’m an equity partner in one of the top law firms in the world. We have 1,200 lawyers in America, Asia, and Europe. I am opening the Denver office for WilmerHale and working on projects all over the world, mostly in the energy and natural resources areas. I’m working currently on an energy project in Central America, an international arbitration matter in Indonesia, and another energy project in the United States. How did you get involved with HACR? I’ve been a long-time advocate for diversity in corporate life, and I think that HACR and its initiatives are really committed to making sure that corporate America reflects the diversity of our country. I was proud to be a speaker at the annual meeting this past year. What are the issues in corporate responsibility that the Hispanic community needs to address? The Latino community is a minuscule percentage of those who actually serve on corporate boards or as corporate executives, and that has to change because we have a growing demographic of Latinos with massive purchasing power and contributions to the economy. It’s important that diversity of the country’s executives and corporate boards reflect that. What advice do you give to young Latinos who are thinking of entering the fields of law, politics, or business? I say to them, go for it. There are now many examples of people who have broken barriers. I was the first Latino ever elected to statewide office in Colorado as attorney general. I’m the first Mexican-American ever elected to the Senate outside of the state of New Mexico. I was one of the first Latinos elected partner at my law firm in Denver in the 1980s, and I am a Latino at one of the top five law firms in the country. If I can do it in my circumstances, anyone can do it. I grew up on a farm in the southern part of the state of Colorado with no electricity and went on to be a first-generation college graduate. I have been able to achieve these things, and I know that within the Hispanic community there are many who are more talented than I am and who will definitely be able to do the things that I have done. How did you get to where you are today from those circumstances? I have parents who believed that anything was possible for their children through education, so they pushed us hard. I think the values that they gave me (hard work and perseverance) have gotten me through many years of my life. How is HACR helping young Hispanics reach their goals? It undertakes a twofold function: first it makes sure that Latinos and Latinas understand that there are opportunities in corporate America and that they should pursue those opportunities. Secondly, it puts a spotlight on corporate America and the lack of representation that Hispanics have in that world. What do you see for your future with HACR and WilmerHale? I am going to be a continued supporter and adviser at HACR because I think that it is a great organization that supports a great future. And at WilmerHale, we would like the new Denver office to be a robust and productive part of our firm. But just like every other chapter in my life, I’m going to try my hardest to be successful at whatever I do.